Inspite of the many post that I have written it took me a while to write this one. For one, I would not know where to start and I am not sure if I want to rekindle the awful feeling, a month ago, about my mortality. In my case, my oncologist had told me a month (January 24) ago that my prognosis is not good. I am starting to build fluids in my stomach, also known as ascetis, which is a sign that my cancer is progressing. The news stunned me. I have received many bad news about my cancer in the past five years, like relapses or malignant tumors, but none shocked me more than the news of an immediate threat to my life. I thought about my family and the unfinished things I will leave behind. I cried and went through the spiral of questions about the cause and options. With my wife holding my hands, we absorb the sobering news. Since then, we have moved on and decided I continue my treatment for a chance to extend my life. That’s all I have to say about this. I don’t want to revisit that feeling again. What I wanted to revisit is the email I received from Carmela when I told her of my set back. She relates her conversation with her friend about me. …she [Carmela’s friend] helps me cope with things and over the past few months has given me advice that I find to be really helpful. I spoke about you. She was very saddened of course. Who wouldn’t be. I told her how I had reacted terribly on Thursday [January 24] but that by the weekend I found myself more at peace with my daily struggles. Why is that “she asked”…. “I don’t know…I just did”. She then said, that is Bo’s gift to you. He has helped you find perspective in things. I then told her how I would have no idea where to start, what to do etc…. and she said “but he does”. She explained how there is a certain peace that comes with knowing that you are taking care of things how you want them taken care of. Of being able to say good bye. Of being able to tie up loose ends. “Don’t get me wrong Carmela” she said “there is nothing easy about this but your friend may have the peace of knowing that he has taken care of his family, his affairs, his friends and that he has lived his life much more heightened to it’s beauty. Not everyone can say that. You experienced this briefly this weekend when you found peace and perhaps did not worry about the laundry or some sie your daughter’s messy room”. I sat back and thought of all that you have accomplished over the past few years. You have trained and run several marathons. You have continued to travel and visit strange new worlds. Your relationship with your wife has flourished. You have been an incredible father, grandfather, and most of all friend. People can live to be 100 and never experience that. Or die suddenly and leave a ton of loose ends. Perhaps an argument with my mom or daughter. P.S. To my family in Manila, please do not mention my prognosis to my mother: she does not know yet and is busy making preparation to come to the US. Two weeks ago,I went to Chicago to say hello to my friend, Bobet (aka ‘Bo’ to most of his North American friends and colleagues) . For those who have never been, Chicago is a great metropolis by the beautiful Lake Michigan. In February, patches of ice adorn the streets and architectural arches while people, unmindful of the cold, leisurely skate in the park’s ice rink. It is beautiful. You must visit. We met Bobet and his wife, Irish, for dinner in his favorite Thai restaurant. I am happy to see him – we greet each other with long lasting hugs to cover all those years of missing each other. I am sad to see what the cancer has done to him. He moves slowly. He is a little thinner and his stomach a little swollen. The edges of his fingers are black (from the chemo, he says). He eats in nibbles. He speaks in short phrases, while Irish attends to him diligently with tender care. She smiles beside him and serves the soup to us, then sneaks the extra shrimp into his bowl. What love! After dinner we hunt for coffee (it is his bucket list, he says). The first cup he has had in years. He savors the first sip. Ahhh! This is good. Irish is worried. She tells him “it’s late”. He shakes his head – not yet. I’m enjoying myself, he says. I smile. The next day Bobet and Irish pick us up and we drive to where the city meets the lake. Everything sparkles. It is breathtakingly cold and beautiful. Someone takes our picture – tourists, they think. Obviously. We pick up fried rice, eggs, and bangus (marinated milkfish) from Ruby’s Restaurant, a local Filipino restaurant that had been visited by Food Network’s Bizarre Foods fame. I see Andrew Zimmern’s, the host of the show, photo on the wall. I am a fan. I am thrilled. We go to Bobet’s home and I meet his peeps (family). His mother-in-law – Nanay, his daughter – Talia, his other daughter – Abby, Maggie the beagle and his grandson Ethan. Whew! So many! The table is set we take our seats in anticipation. Grace was said first – then pass the vinegar! In between mouthfuls I look around. Ethan is happily shoving fried rice into his mouth. Talia and Abby tag-teaming Ethan. Nanay fetching things from the kitchen, Irish passing food around making sure Bobet is eating. Smiles and laughter all around. More troop in! A nephew and a son. They have come from the gym. Big strong boys. They live here too! I look at the family that Bobet and Irish have built; an army protecting them. He is well guarded. In the tradition of a role-playing game we used to play in college, Dungeons and Dragons; Irish is the lead elf-vanguard of the army. However, she is not a tall, cold Tolkien elf but more like an agile pixie. Even with her new spiky hair-do, Irish can whoosh under a five foot high limbo bar, without stooping. In the die roll for Love and Courage she rolled an 18. +3. Also, she runs marathons so that she can run beside him. She will run beside him all the way, I know, and if possible not let go. He is in good hands. Time for a last round of pictures at the door. He blows a kiss. Don’t let this be good-bye, they said. Come back again! “No Mack truck today, Ethan!” My mom called out. Lately, the house has been awfully busy with guests and visitors coming to visit. I thought they were coming for me but instead they came for my Ampa. First was Lala’s college friends from Connecticut (Auntie Cecile) and Philadelphia (Auntie Tina). How we have become blood related, don’t ask me: It is complicated. Apparently, among Filipinos everybody is an aunt (“Tita” in Filipino) or uncle (“Tito”), you just don’t address them by their first name. No…No. Then there is the ritual of kissing their hand which my Ampa imposes as a mandatory greeting of elders. Being the smallest you could imagine how many hands I have to “bless”, of course, I could throw a tantrum which always works. Boy, I am good. There is Uncle PeterP and his family who came to visit, also. They are close family friends and they brought some of Ampa’s favorite food. Food and Filipinos are synonymous; there is always food around. There is so much foot traffic in the house that I am unable to drive my Mack truck. For the this weekend, I hear more visitors are coming. There’s Auntie Ria and her husband Uncle Rene from Houston, TX. 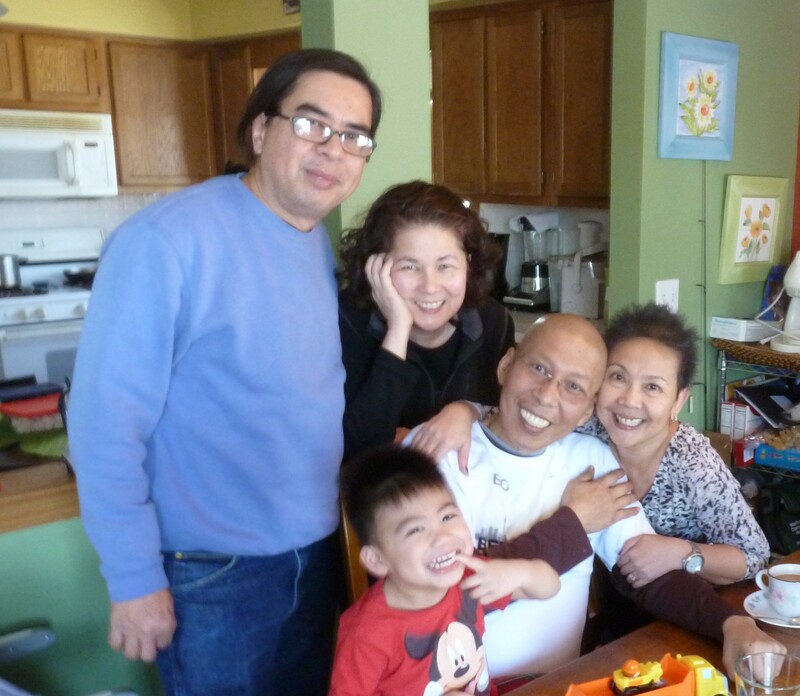 I hear Auntie Ria is Ampa’s college friend back in Manila and had insisted on visiting. Wait there’s more: the following weekend it will be Ampa’s sister and her family from Canada, and his brother coming in from Manila. Full house! I just hope they bring some goodies for me. Yes! Friends and family are what makes you. They bring you love and strength when you need them. They are always there. I thank God I was born to this family. Moreover, I am glad my Gramps is with me. PS: Ampa had his stomach drained again and they got two liters. Wow.